Visit of the Australian Central Asian Studies Research Team (Macquarie University) to the Trust 4.07.2011 and presentation of publications. Dr Gunner Mikkelsen worked on the Corpus Fontium Manichaeorum project which was based at the Trust from 2000 to 2005. 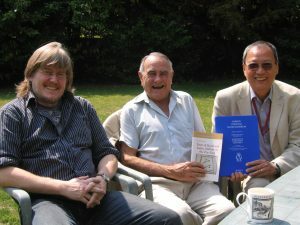 Dr John Sheldon had been a student of the late Sir Harold Bailey (Sanskrit and Khotanese) 1961-1963. Professor Sam Lieu is a recently appointed Trustee of AIIT and he will begin a Visiting Fellowship at Wolfson College (Camb.). in early 2012. G. Coedès, Greek and Latin Authors on the Far East, Vol. 1 Texts and Translations, Studia Antiqua Australiensia Vol. 4 (Brepols, Turnhout, 2010); ISBN 978-2-503-5366.